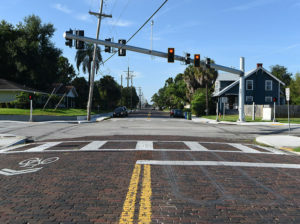 West Cypress Street and North Willow Avenue Traffic Signal, Hillsborough County, City of Tampa - Faller Davis & Associates, Inc. The project involved upgrading and replacing the existing traffic signal, and sidewalk and crosswalk improvements. Replacement of the aging single span wire with a mast arm provides a rigid support that is more resistant to hurricane winds and eliminates the need for a joint-use utility pole as a traffic signal support. Relocating the traffic signal controller cabinet from the southeast quadrant to the southwest quadrant provided additional sidewalk width in the southeast quadrant. Additionally, the reduced radius in the southwest quadrant allowed a reduction in pedestrian crossing distances, reducing pedestrian exposure times.